Trend alert! Pink and metallic copper! These colors paired together create a fantastic design scheme that will warm up any space. This trend works amazingly in a bedroom or bathroom, but also works well in an office, guest bedroom, reading nook or den. This look grabs attention in a formal living room or can create a sense of calm and peace in a bedroom. Find out now how to pull this look together! Start with your selection of a shade of pink. Choose a soft and calming pink, a muted shade of dusty rose. This soft pink should be the star of your show. Use this to paint the wall or as a major textile piece within the space. Accent colors that work well with this color scheme are grays and creams, along with other dusty shades of pink. Pink paired with metallic copper gives off a calming, warm and peaceful feeling. This is why grays or creams pair best. Make sure to prominently feature copper in this room as well. The wall tile City Scape, available from Questech, is a perfect addition to the decor. Rather than adding small copper accessories to a room, make a bold statement that is softened and offset by the subdued colors of dusty rose, gray and cream. This design scheme brings in several textures, multiple layers and natural elements, creating an interesting and inviting space that is at the same time intriguing and comforting. The space has the ability to draw you in and makes you want to stay a while. The mood of a space decorated in pink and metallic copper evokes calm, love and promotes rest. Natural elements such as sea shells, marble, iron or granite would further help this space to be a true success. 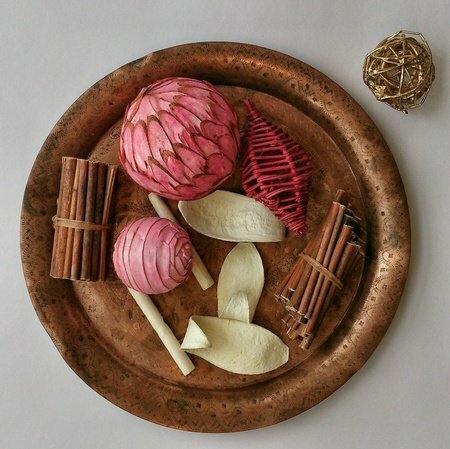 When using this design style, make sure to pull in other natural elements to further enhance the beauty of pink paired with copper with additional natural textiles such as cotton and linen. If you are interested in this intriguing combination, make sure to stop by one of our locations to talk to one of our showroom consultants. We are always ready to help!